The Pre-Assembled Sliding Pocket Door System is available from JAS Timber! A pocket door system that enables your doors to slide conveniently into a wall cavity, saving space, whilst looking incredibly stylish! Easy to install with a rigid frame, pocket door systems are supplied pre-assembled so that they can be fitted in half the time of other brands. Available for both single and double situations in a selection of sizes. Almost all of JB Kind's internal doors are suitable for use as a pocket door. 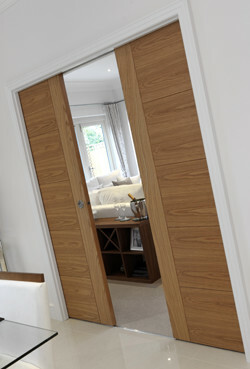 The Pocket Door System is available from JAS Timber now! Subscribe to our newsletter to catch even more special offers along with product updates and project ideas from JAS Timber - tell us what you think about JB Kind Doors & the Pocket Door System - Please leave a Product Review!